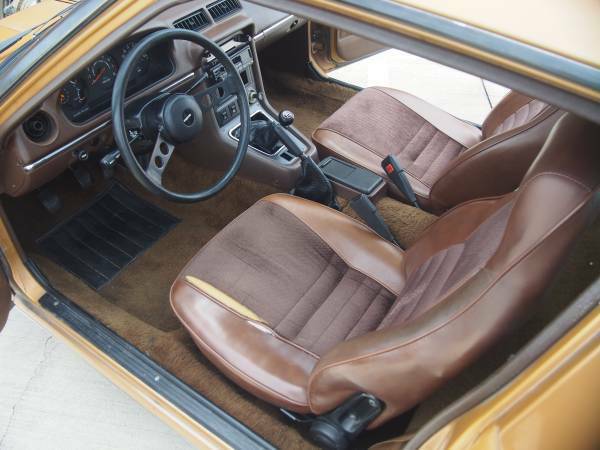 The original (SA or FB) generation Mazda RX-7 is a delicious modern classic for the budget car shopper who doesn't mind a 4-speed gearbox or a copper/goal paint job.. Prices are about as low as they will ever go and should be on the way up. If you find a nice one, own/drive it for a few years, you might not lose a dime on it, even if you budget for a minor engine rebuild every 75k miles. 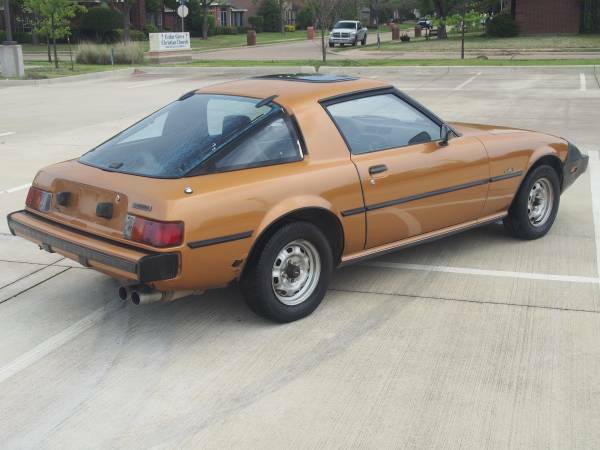 Find this 1980 Mazda RX-7 offered for $3200 in North Dallas, TX via craigslist. Tip from Sam. 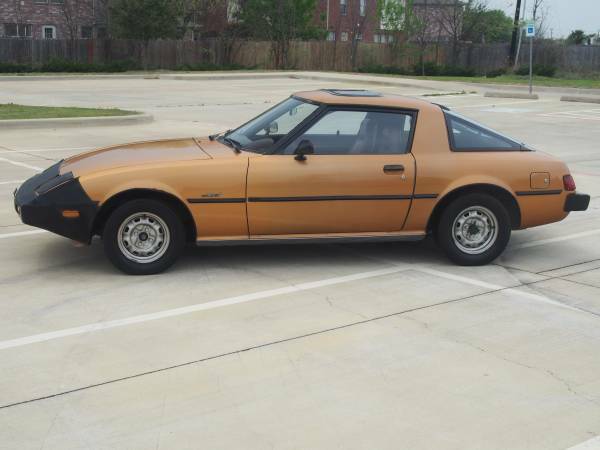 Up for sell or trade is my 1980 factory Mazda Rx7. 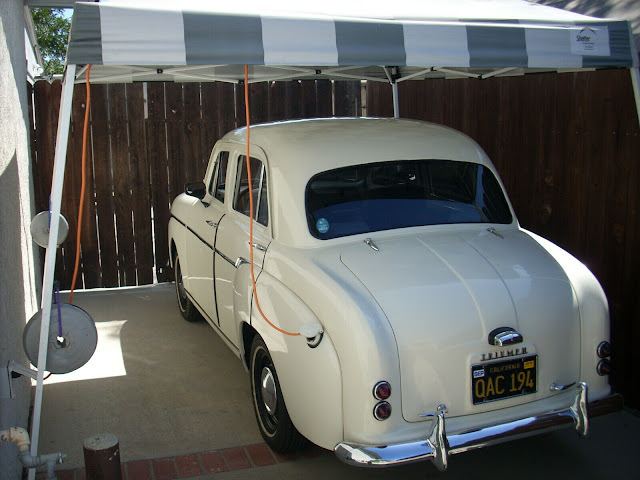 The car has been garage kept majority of its life and has a 1146cc 12A Rotary motor with 98k original miles. Car has a choke and is a 4 speed manual transmission. The body is in overall good shape with a minor rust spot on the rear quarter behind the wheel (see pics) other then that interior is super clean with minimal wear and tare. Driver seat has torn a bit but nothing major. All other features work properly on car (lights, windshield wipers, a/c) car also has manual locks and windows with after market sun roof. The carb was recently rebuilt along with a tune up, gas filter was recently changed as well. Car comes with a bunch of books and manuals period correct for the car and a black bra for the front bumper and head lights. The car does start and run good but shortly after the purchase the car had some issues. Not 100% sure whats wrong but its not major, theres no knocking but when the car gets up to temp it seems to lose compression and cuts off so not sure if seals need to be replaced or the fuel pump could be going out or one of the vacuum solenoids went out. Either way i dont know much about Rotary and dont know anyone who does either and dont want to jack the motor up so putting it up for sale or trade to see whats out there im pretty open minded to trades so tell me what you got if not we can come to a cash agreement. Again car does work just dont have the time to take it to a shop and see what the actually issue is, car sat for about the last 6 years and was started every now and then to prevent it from just sitting so problems could just be from old seals and build up. Clean Texas Title in hand. Not in a hurry to get rid of and dont need help selling. I don't know why, but I have always loved me an FB and FD RX7. FC can, well, go FC itself. The styling just doesn't do it. Relatedly but separately, I've been wondering about inflicting an own-goal and swapping the 1.9 WBX from my west for a twin-turbo FD engine. I assume cooling would be inadequate and obvs the VW transaxle would not stand for such revving... but it sounds fun, at least. Seller has not had the car long enough to recognize tenths on the five-digit odo. Always loved these. But is it a turned over 9800 or 98000? Would be weird to have a tenths in the overall mileage, but also weird to have the last digit white if its not tenths. Also, how does one gauge do both RPM and volts? Seems like a neat trick if it can. This guy obviously didn't try real hard to find a shop that knows rotaries. One of the best known rotary shops in the states (Rotary Performance) is in Garland, a major suburb of Dallas. A simple google search would have brought it up. Also if you're interested in the car getting a pre-purchase inspection there would be a wise move. I can assure you they can diagnose the problem.